Storytelling is an important part of every successful brand’s marketing strategy. All major corporates are using it, and they are seeing great results from it. As the marketing world evolves, there’s nothing that says that you shouldn’t bring storytelling with you when exploring new ways to market your brand. Social media being one of them. Storytelling is difficult without a proper plan or knowledge of how you do it, but once you’ve mastered it, it’s as easy as 123 to tell captivating and engaging stories to your audience that gets them to talk about your brand and gets them impacted by the messages you convey. In this article, we’re digging deep into storytelling, finding out what it is, why you need it, and how to successfully impement it into your social media marketing strategy to generate even better results thatn you are today. But when brands market their products, they are not always using storytelling that adds that “captivating and resonating touch”. That’s the job of storytelling. Storytelling is the ultimate way to bring life into your brand as it brings your audience on a journey, following your brand’s and your product’s identities. If you would describe it in the simplest way possible, you would say that storytelling is the art of using stories when marketing your brand. Simple as that! When using storytelling, you are using the same tricks that you use when telling a story in real life. But to be able to use them, you must first know what they are. In an easy format, storytelling is the art of giving shape and meaning to a piece of information that’s dull and boring. Storytelling has many benefits. And frankly, if it wouldn’t work, no brand would use it. But today, all the brands who know how to use it, and realize the importance of it, implement it into their marketing strategy. Coca-Cola, Pepsi, GoPro, Mcdonald’s… do you want me to continue? I think you get the point. 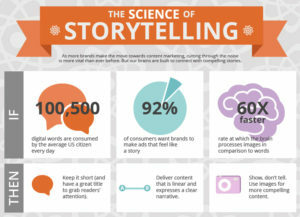 These are all brands who have mastered the art of storytelling both off and online, and even though social media marketing is something relatively new, in contrast to older forms of marketing, these brands have quickly been able to adapt and implement what they know about storytelling into their social media. The fact that large brands are using it isn’t an argument to why you need to use it, though. The most important reason to why you need to use storytelling is emotion. As a brand, it’s difficult to impact and affect your audience emotionally. Most of the time, your customers won’t become emotionally affected by looking at a product image from you, right? And if they would, good job with whatever you did! In any case, what will have the biggest emotional impact on your audience is emotional branding. This is the marketing strategy that you can implement in your social media that has the potential to drive revenue and increase your customer retention. How your customers feel about your brand has a huge impact whether they buy your product or not. Believe it or not, but a brand is more about perception than anything else. 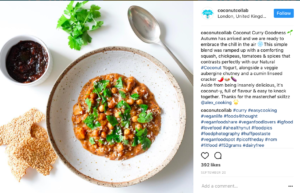 When you successfully tell your audience a story that is captivating and emotional and includes all the recipes for a good story, you create an experience that will resonate with your audience. Since the age of dawn, people have been telling stories. First orally, then in book form, and now online. Stories have been told by old, young, as well as brands. Back in the days, many stories were told because they had a message, and the teller wanted to learn the listener something. As a brand, this gives you an opportunity to learn your audience about your brand and products, without coming off as too promotional or losing your audience’s interest. The main principle of storytelling remains the same after all these years. That’s quite astonishing. But when you think about the reasons, it’s not that strange! Stories are captivating. No matter if they are being told by a brand or a person. A story has the tendency to be remembered long after it was told, and it makes message pass easier. Storytelling is an art that can be hard to master. It takes time and practice, but anyone can master the basics of good storytelling. But how do you do it? How do you tell compelling stories? How do you tell stories that your audience wants to hear? And how do you tell your brand story, while also incorporating marketing in it? All of these questions are highly relevant, and it is also those questions that lay a foundation to good storytelling. When you craft your brand story, you need to decide what your voice is, what your values are, and why your stories are relevant to your audience. The reason you use stories is to mediate your messages in a better way, to market your brand in a more effective way, and to engage your audience. The ultimate goal is always to sell more, but don’t let your eagerness to sell get in the way of telling a good story. Your selling must be creative, subtle, and indirect so that it doesn’t harm the story experience or the credibility of your story. A great example is 1st Phorm supplements. On Instagram, they shared a short fun and engaging video that was trimmed to perfection. 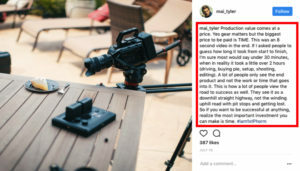 However, shortly thereafter, their Creative Director Tyler who had created the video, shared on his very own Instagram, the story behind how he created the video. He told people how much that had gone into creating that few-second clip, and with that, he wanted to convey a message with his story. The message that there is more to it than meets the eye. And when he did, it made people value the finished product more, because they understood how much work that had gone into it. This is just one of many examples of how you can use storytelling to empower your initial message and to make people more engaged in it. When many people try to think about a story to tell about their brand, it’s often completely blank. But the truth is that everyone has a ton of stories to tell. What is the reason to why your business exists? This is the type of stories that everyone wants to hear because it gives hope that they too can reach that level, starting from the bottom. Tell a story about how you developed your products or how much hard work was behind the finished product. People love to hear the unpolished reality – especially from brands who only show their perfect side that is always polished and proper. It makes them display themselves are more human, and people have an easier time resonating with brands who are. Telling a good story is hard, I can’t deny it. But by learning the ingredients and tricks that go into a successful recipe, you can start mastering the art of storytelling, and eventually, it will come naturally, where you don’t have the recipe in front of you to succeed with it. The Coconut collaborative uses the right words to give their audience a backstory of the posts they are sharing. Having a cohesive brand voice is relevant anywhere and anytime. Keeping a consistent brand personality is something that never goes out of style, and therefore, you have to create one, be fully aware of what your brand’s personality is, and then stick with it. That includes when you are storytelling on social media as well. In other words, the stories that you tell should reflect our brand’s personality in all the ways that make up a personality. This means your tone, vocabulary, and approach you take when communicating on any of your channels. It’s important that your brand personality is cohesive because it will allow your audience to build a better relationship with you. If you meet your friend and then all of a sudden, they’ve gone from being shy and nervous to confident and aggressive, you’ll have a hard time remaining friends with that person because they are no longer the person that you initially became friends with. By setting a brand voice and then sticking to it, you can also appeal to your ideal customers in a better way, because you choose a personality that resonates with them. If you want to tell stories that make an impact, and that lays up the ball for a smash at the end, you need to have good structure. 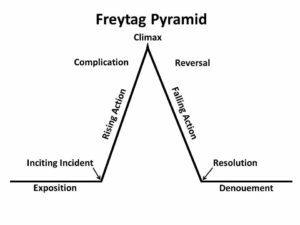 The structure that almost all good stories follow is Freytag’s pyramid. Following the Freytag pyramid will allow you to shape your story material in a mold and make sure you tell compelling and interesting stories every time. There’s a reason why everyone is using this structure. It works! While you don’t necessarily need to include your customers in every story you tell on social media, it is definitely something you need to think about and put great emphasis in. After all, your customers are the reason for everything you do, and the cold hard truth is that they decide whether you are successful or not. They decide if you succeed in cutting through the heavy noise on social media or if you’ll drown in the competition. Furthermore, your customers aren’t just important to include in your storytelling because they are the ones that decide how successful your business is. There are also several other benefits of retelling your customer’s stories or getting them to tell their own story. The main benefit being trust. In fact, 92% of people trust peer recommendation, even if they don’t know them. That’s quite powerful. In storytelling, emotions are extremely important, because they can have a huge effect whether someone becomes a customer or not. 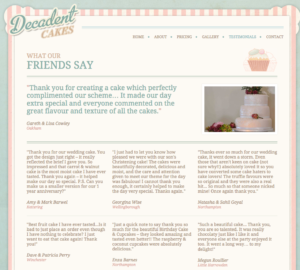 Decadent cakes use customer testimonials and weaves it with compelling storytelling. The marketers who have mastered the art of playing on feelings, while also telling a compelling story have the power to dominate the world. The bottom line is that if you’re trying to convince people how good your product is, what do you think will generate the best results. If you are telling people about how good your product is, or if you get your customers to tell their very own personal story to how your product has improved their life, and how it has affected them emotionally? I can’t talk about the recipe to telling a great story without including feelings. I’ve touched upon it a bit already, but emotions in marketing are such a wide topic that demands a lot in order to be fully covered. Humans are emotional creatures. We often make decisions based on how we feel. And if someone or something can make us feel some kind of way, it might convince us into purchasing something. This is also the reason to why brand message and brand personality is so important. It’s also the reason why great stories in marketing have such immense power – because they include emotions, and evoke feelings in the reader. Avoid telling stories that come off as a straight-up sales pitch, and is stiff and boring. These stories won’t have a long life, and nor will they have a big impact on your audience. When you play on feelings, you’re also including your own feelings and personality, because it helps humanize the story you are telling, and allows the brand’s personality to shine through, leading to an emotional connection with your audience. 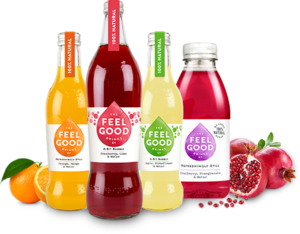 A brand that uses feelings in their marketing and not only in their social media marketing is Feel good drinks. In fact, they play on feelings so much that they have decided to include the word “Feel” in their name. That’s clever! When you are personal in your stories, it opens up a whole world of opportunities for you when telling stories. For example, chances are that you are quite similar to your target audience. Most of the time, the person developing the idea and the product, is someone who is facing an issue that they have had and now want to solve. This also means that if you have had the same problem as your customers, you have something in common, and you have something that will let you connect with them better, and reach your target audience better. The best part about this is that you can tell your very own stories about the problems you were facing but how your brand now solves it. The principle is exactly the same as getting your customers to tell about their own experiences, only that you give another perspective and experience. The key to a great story is making yourself more human. This is something that every brand should strive towards as it will let you become more approachable, which ultimately leads to more people engaging with you, and having an easier time building a relationship with you. This is exactly what telling your brand’s story helps you do. People want to get to know your brand, but that is only possible if they know the story behind it all. Tell the story of how you and your partner worked day and night to make your dream come to life, and tell them how you sacrificed many hours of sleep to make your goal become a reality. Even if your story can to some extent be fiction, the story you tell on social media needs to be honest and accurately reflects your brand. Your stories can’t be full of lies, giving your customers unrealistic expectations. Because this will only hurt you in the long run. Be honest about your brand and be honest about your products. If you always keep it to the truth, you’ll slowly but surely establish yourself as a brand that is worth trusting. When you use real and true examples in your story, it will come off as more authentic, and it will impact your audience on a deeper level, while also making it more trustworthy. A way to back up your stories and the fact that they are true is to tell a series of stories. This also brings me to another important aspect of a great story: being detailed. The more detailed you are, the more engaging your story will be as your audience will be able to imagine themselves being in that situation. What’s more, your story will also be more trustworthy, because you are able to back up your story with examples, and rich details. Storytelling is something that all successful brands do. It is also something that all successful humans do. Those who can tell appealing stories have an incredible power. Storytelling is important in every aspect of your marketing, and this also includes social media marketing. By learning the principles of great storytelling, you can attract new customers, convince your followers to buy from you, and market your brand in a better way.